Please join us on Wednesday, April 24 at 6:00 to 8:00 p.m. to celebrate Young Audiences of Northern California’s 60th Anniversary! 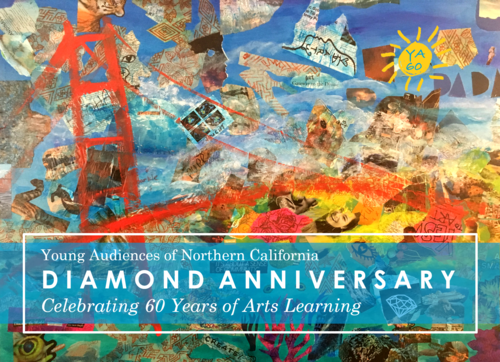 Diamond Anniversary: Celebrating 60 Years of Arts Learning will showcase several of our talented Teaching Artists with performances and collaborative art-making. Delicious appetizers will be provided by Weir Catering & Events. Hosted bar includes beer, wine, and a featured cocktail. A live auction features many not-to-miss opportunities that are unique to the Bay Area! Admission is $60 per person. All proceeds benefit arts education, impacting thousands of kids throughout the Bay Area. Our celebration will be hosted at SOMArts Cultural Center (934 Brannan Street in San Francisco). Can’t make it? Please consider making a donation to help us make an even bigger impact on arts education in the Bay Area for another 60 years! Street parking is available (and usually plentiful after 6pm). Flat rate, uncovered parking lot is accessible across the street at 935 Brannan and 8th Streets. A bike rack is available near the Main Entrance (down the driveway). SOMArts is within two blocks of Muni lines 12, 19, 27, and 47. Civic Center/ UN Plaza BART Station is located on the corner of Market and 8th Street, and is 0.7 miles away. Please click on the map above to access detailed public transit. driving, and bicycle directions via Google Maps. From the North: Follow 101 South across the Golden Gate Bridge. Turn right onto Scott Street. In a half mile, turn left onto Bush Street. In another half mile, turn right onto Gough Street. After one mile, turn left onto Fell Street and continue on 10th Street. Use the left lane to turn left onto Division Street. Turn left on to Brannan Street and SOMArts will be on the left. From the South: Take 101 North to San Francisco. Continue to Bryant Street. Take Exit 433C for 9th Street toward the Civic Center. Continue on Bryant Street and use the right lane to turn slightly right onto Bryant Street. Take a sharp right onto 8th Street and then turn right onto Brannan Street. SOMArts will be on the right. From the East: Take I-80 West to San Francisco and continue across the Bay Bridge. Take Exit 1C toward Ninth Street/Civic Center and keep left at the fork. Follow signs for 8th Street and merge onto 8th Street. Turn right onto Brannan Street and SOMArts will be on the right. Young Audiences of Northern California connects professional artists with schools and brings essential arts learning and cultural resources directly to students. Our diverse roster of award-winning artists and ensembles spans four art disciplines: dance, music, theatre, and visual arts – and offers artist residencies, workshops, assembly performances, and professional development for classroom teachers.